Marco Polo vs. DJ Seven:30 on the 1's and 2's. Doors @ 9pm 19+ w/ 2pcs. ID. 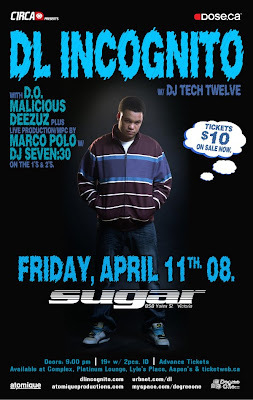 When DL Incognito’s first record came out in 2002, he was proclaimed as Canada’s bestkept urban secret, a newcomer breathing life into a semi-comatose hip hop scene. The album, called A Sample and a Drum Machine, dug deep into the crates to bring the authenticity of old school hip-hop back to the forefront. In 2006 DL Incognito followed up quickly with his third full length recording titled “Organic Music For A Digital World.” The album was also nominated for a Juno in the 'Best Rap Recording' category. DL Incognito’s appreciation for hip-hop is demonstrated by his dedication to his craft, his music achieves authenticity in a music industry that has become commercialized almost beyond recognition. Known for his live shows where DL delivers “a trip down memory lane, you get beats, rhymes and life. No gimmicks just straight hip-hop.”DL Incognito’s fourth album, A Captured Moment In Time, is slated for release on April 8, 2008 on URBNET Records.